Don’t go to the opera for historical fact. That’s a time-tested axiom. And one San Francisco Opera’s production of Roberto Devereux not only supports but makes a virtue of. Donizetti’s 1837 opera is said to be based on a history and a tragedy, but at its heart it’s a simple Italian love triangle with exotic celebrity characters. Exotic because Queen Elizabeth I and her court were distant in both time and place from Donizetti’s operatic Naples. Director Stephen Lawless and set designer Benoît Dugardyn have placed the opera in sets resembling those of the recreated Globe Theater in London’s Southbank. And during the overture the Queen, albeit a doddery and balding version of Elizabeth I, enacts a short and rather cursory history of her life, as if in a pantomime: the Spanish Armada and the victorious English navy portrayed by small flats wheeled across the stage, Henry VIII and Anne Boleyn mere costumes in glass museum cases. Supertitles explain. Sondra Radvanovsky is Queen Elizabeth I in the Donizetti’s “Roberto Devereux” at San Francisco Opera. Photo by Cory Weaver. The opening theatricality strikes close to the reality of the Tudor court, which was obsessed with ceremony and decorum, and cues the audience that what follows may be just strutting on a stage. But throughout the opera, the starkness and upright tiers of the theater also emphasize the fervor of the opera’s emotional moments. Elizabeth, the man she loves, Robert Devereux, and the woman he loves, Sara, Duchess of Nottingham, are front and center stage, in radiant colors, their court looking down at their lives from the shadowed balconies of the set. Sondra Radvanovsky is stunning and forceful in the role of Elizabeth I. From the first aria, she shows her formidable vocal prowess, ascending and descending in a fury of emotional coloratura, while at the same time wielding assured dynamics. Most impressive was her shift from a fervent full-sound coloratura to a tender lyricism, all matched perfectly to the emotional content of the music and the lyrics. Mezzo soprano Jamie Barton sang the role of Sara, Duchess of Nottingham with precision and care, much as a woman in her tenuous position might. And tenor Russell Thomas rendered an accomplished Earl of Essex, though with less swagger and more sympathetic arias than the actual Robert Devereux was known for. Andrew Manea sang the role of the beleaguered Duke of Nottingham, who supports Essex until finding out the Earl has been shagging, or at least trying to shag, his angelic wife, Sara. The baritone delivered a long and dramatic aria, but no one quite reached the emotional intensity of Radvanovsky. Clearly, the soprano loves this role. And who wouldn’t love being kitted out in Ingeborg Bernerth’s gorgeous costumes. With Elizabeth in fiery red and Sara in summer-sky blue, each matching their drapes; the courtiers in greys and blacks, providing a decorous backdrop to the heated emotions spilling forth in sound waves. Riccardo Fizza conducted the opera orchestra, which was its usual splendid self. And there is much to be said for Donizetti’s dramatic musical rendering of the story. Devereux is beheaded, but fortunately not on stage. And it’s a refreshing change from the usual how-will-this-woman-in-love-die? of Italian opera. Devereux did die of beheading, but for political rather than romantic reasons. I often wonder what historically based opera and theater would be like if it more accurately followed history. After all, it’s not like England’s Virgin Queen lived a boring life…. Even so, this is a decorously produced and lusciously sung opera. 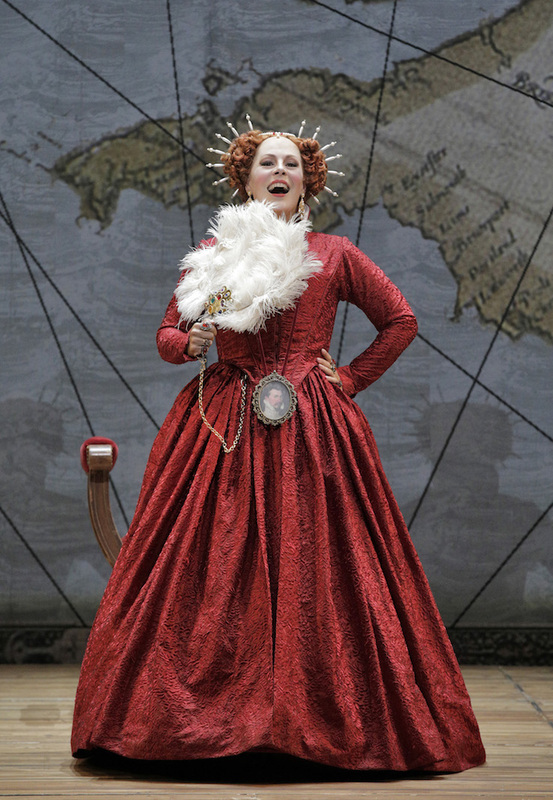 SF Opera’s production of Donizetti’s Roberto Devereux continues at the War Memorial Opera House through September 27. For information and tickets, visit sfopera.org.